Radio Measurements Equipment. 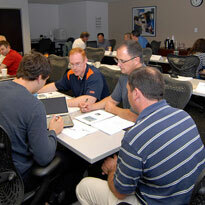 Customized onsite course taught by Best-in-Class Eogogics instructors in Washington, DC, Virginia, USA, worldwide. This course is part of a special curriculum that brings together in one place a series of courses dealing with spectrum monitoring, vector analysis, and spectrum management as well as spectrum monitoring system organization and measurement equipment characteristics. The present course is aimed at those who wish to study the radio measurements equipment and measurements procedures in some depth. The course duration, indicated as 2-3 days, depends on the desired depth of coverage. Customize this course to your own requirements at little-to-no additional cost. We can teach distinct versions of this course tailored for audiences such as new hires, experienced personnel, managers/executives, and non-technical staff. The specific issues discussed in the course, as well as the depth of treatment for each, can also be tailored to your need. Those with RF/wireless background who wish to study the principles and operation of radio measurement process and equipment as employed in spectrum monitoring and management.